Being based in Baix Emporda, our trips to the more northern Alt Emporda are relatively sporadic so we haven't done that much walking in the areas boarding the French border. 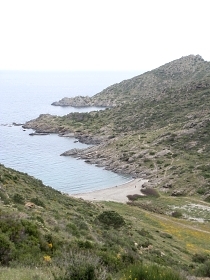 Specifically, we haven't explored that much of the Cap de Creus areas - one of the most celebrated walking areas in Catalunya which is about an hour to an hour and a half from home. The Cap de Creus is a hilly/mountainous cape that sits to the north of the Bay of Roses and geologically forms the final extent of the Pyrenees before the sea. The area is famous for its light attracting famous artists such as Picasso and Dali in the first half of the 20th Century. 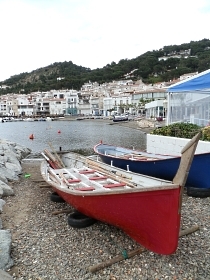 It's also the area of Cadeques, one of the best known white-walled fishing villages in Catalonia. The landscape itself is relatively harsh. It's quite rocky, barren in places with a covering of gorse and shrubs and in the height of summer is dry and windswept. In some ways it reminds you of Scottish moors and mountains. There are plenty of bays and views and isolated pebble or stony beaches. Routes through and around the Cap de Creus are full of curves and bends so car travel is slow. Walking wise, the GR92 passes through the area as do a number of other paths and routes. 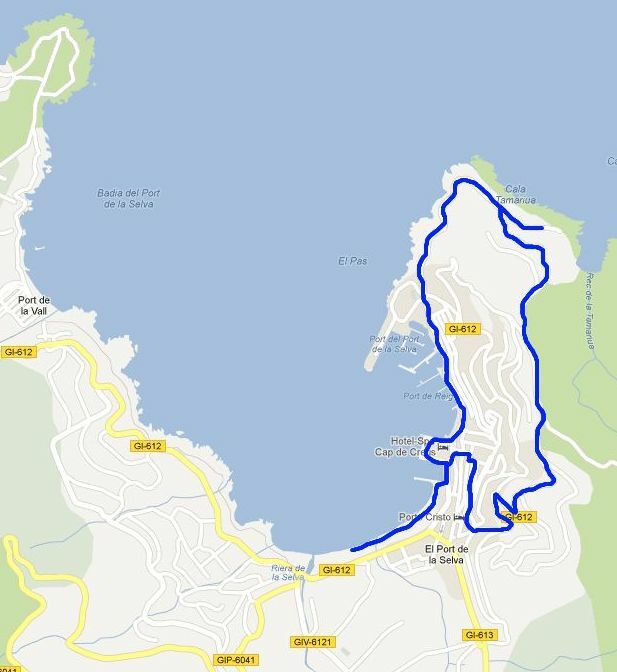 For instance it would be possible to walk from Port de la Selva to Cadeques - about 16km - though this is a long route if you have to come back too. 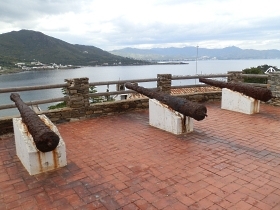 So this is more of a visit than a walk, but still the chance to see a little bit of the surroundings of Port de la Selva on the northern side of Cap de Creus. Port de la Selva is just around the corner from Llanca, so easily accessed. 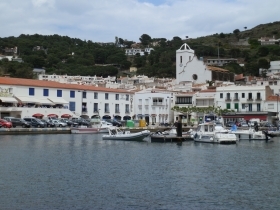 The town sits in a 3/4 bay and looks back towards Llanca and up the coast to Colera. Behind the town are hills/mountains that reach around to Cadaques. As you drive in from Llanca, you can see a monestery (Sant Pere de Rodes) and a castle up to the right. The monestary is a grey colour which can get camoflaged by the rocky hills around it. Port de la Selva has a small semi-pebbly beach and a small church. The time we were visiting most of the tourists seemed to be French, possibly from just across the border. Houses are built up the hills almost leaning precariously over the relatively steep hillsides. We park in the car park before the town and walk along the beach. Even though we're in mid-May there is practically no-one on the beach. It's true it's a combination of sand and pebble and the day is overcast but the whole town looks quiet. As we get nearer to the buildings though, we can see that the restaurants look pretty full. Catalans (and French visitors), typically take dinner around 2-4pm, and take dinner very seriously. Shops close and shoo the last customers out as dinner time approaches and whole towns close down over lunchtime. At the weekend and for festas, 'lunch' - more properly dinner as in Christmas dinner type timing - can run from 1pm to 5pm, which to us who like to be out and active at the weekends seems to knock the stuffing out of a Saturday or Sunday. We walk round the edge of the town harbour. It's a proper working harbour, not a marina and fish nets, ropes and lobster pots are laid out carefully on the quay. There are other boats, but also the traditional Catalan Llagut/Sardinals boats made of wood and latin-rigged with a long yard arm that sail like a Dhow. As we leave the town on the far side, the terrain becomes harshly rocky. We follow the sea over the rocks. On one of the pebbly beaches an set of French divers are exploring the water. The rock pools have crabs and snails and bits of sea-weed. Out of the last of the small pebbly beaches we walk up the stairs. The path is made for strollers and tourists. At the top of the steps we join the road as it climbs over a cove and up to the next headland. The road turns the corner and we can look out over the craggy hills around the next bay. These are deserted, just low scrub in a mottled green with dots of yellow from the gorse, which is in full flower. There are still houses here though. It feels quite bleak and the houses and walls show the effects of the sea, salt and wind. Even though it's the Mediterranean in front of us, it could almost be a Scottish glen - except that is for the small swimming pools in the gardens. The rock formations are strange. The movement of the earth has turned the stratification of the rocks around 90 degrees. So rather than lying flat, it juts up, and the rain and water has got in giving the rocks a jagged top that looks as it could cut. Down below we see another beach, pebble again, but we follow the estate around the top. We're back on the GR92 and though we're just doing a few hundred metres we can see the signs and maps pointing the way across the harsh landscape out towards Cadaques. And, at the top of the estate we turn back down and into town. We can see Sant Pere de Rodes in the heights above the bay looking grimly out over the sea. The restaurants have emptied and now the town genuinely is empty and closed. We walk round and there's a sense that everything could benefit from a little bit of TLC, white buildings tend to show the rain. We'll explore more - this was really little more than a taster, but we're not sure about the terrain. It's dry and harsh with abandoned agricultural terraces (suggesting it was once more fertile?) and few trees. Some people love it. I'm not so sure.